I'll let you in on a little secret. I love guest posts. Less work for me, keeps the blog fresh... and hopefully I get to introduce readers to some new voices. Last week, a precocious fifth-grade girl asked me for help with finding some "good books" to read for fun. She wanted something realistic and humorous, so I immediately thought of Paula Danziger, whose books I had loved at that age. The girl had already read and enjoyed "The Cat Ate My Gymsuit," so I picked up a copy of "There's a Bat in Bunk Five" to show her. I flipped through the book to check its condition before giving it to the girl (with library books, you never know if a page or ten are missing) and this red piece of paper fell out. The "bookmark" label says business, but the smiley face says fun. Happy reading! 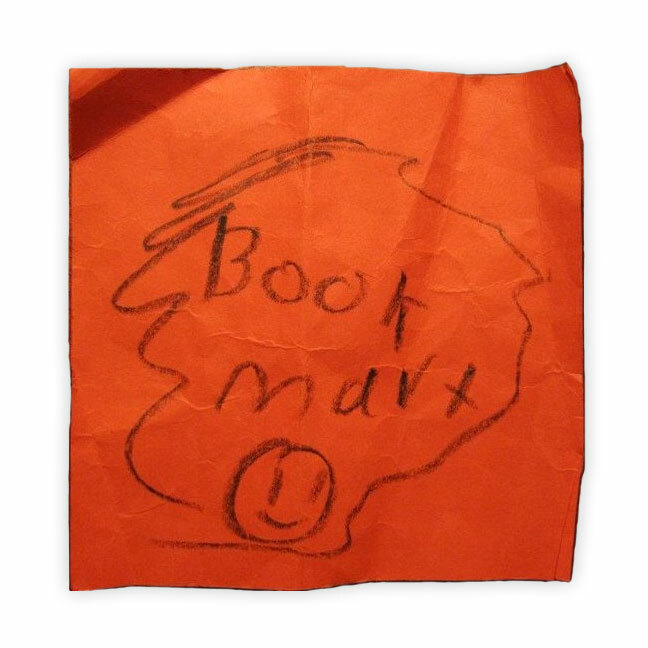 I actually thought it said "Book Mart," and the smileyface was appropriated from another, lesser "Mart" we all know. Possibly the sign the previous reader had made when playing bookstore.